3 DVDs · approx. 5 hrs. 15 mins. THE ULTIMATE GUIDE TO MAXIMIZING YOUR SCORE! Often required for admission and/or placement at many colleges, the SAT Subject Tests are designed to measure high school students’ knowledge of various subjects. These fast-paced exams offer prospective college students a unique opportunity to demonstrate their thorough command of the material ” and set their college applications apart from those of their peers. In this exceptional review, a veteran science educator presents detailed solutions to real SAT-type physics questions about mechanics, electricity, magnetism, waves, optics, heat, thermodynamics, and much more. 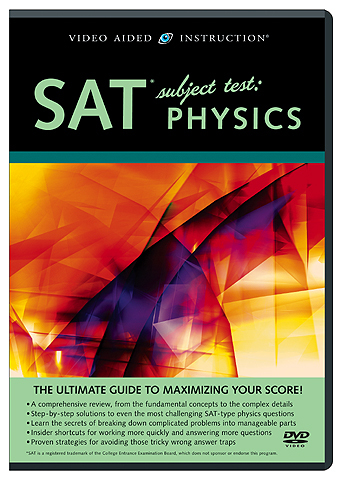 Viewers will review many of the fundamental principles required for a solid foundation in high school physics, with an emphasis on those topics that appear most often on the actual exam. They will learn the secrets of breaking down complicated problems into manageable parts and insider shortcuts for focusing their effort, improving their recall, and applying their knowledge to tough questions. Plus, they’ll discover our time-tested tips, tricks, and techniques for answering more questions ” and getting them right!